From frozen deep fry at 350 ºF for 3 - 5 minutes or until internal temperature reaches 165 ºF as measured by use of a thermometer. 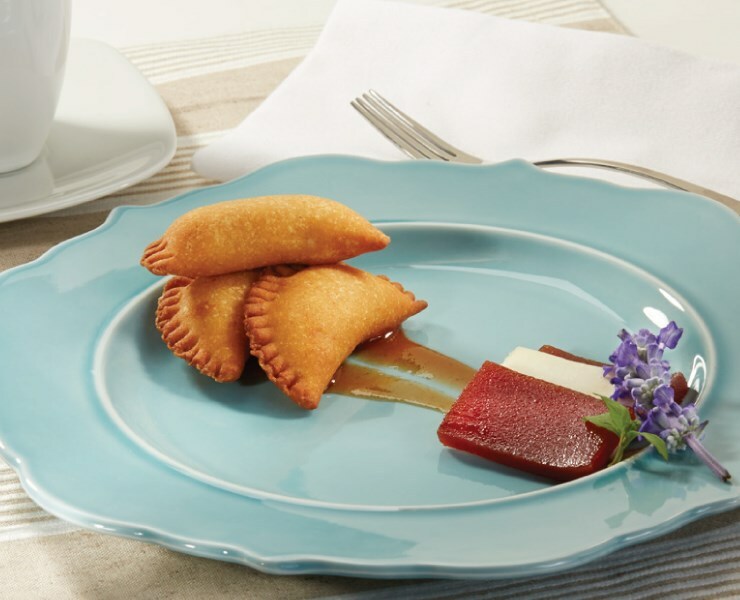 Perfect for morning breaks with a side of fruit and a cup of coffee, or as a mini plated dessert with a scoop of Dulce de Leche ice cream, Kabobs’ K7107 Guava-Cayenne Empanadas are a versatile addition to your menu. We start with the exotic, sweet flavors of guava and apples, then pair it with a creamy blend of cream cheese and Queso Fresco. To compliment the sweet and savory notes, our culinary team then adds a dash of cayenne pepper for a truly remarkable dining experience. Baked or fried, these Latin American inspired street food hors d’oeuvres / appetizers are a welcome addition to your dining guests requesting more unique, and authentic regional flavors. • Versatile - Breakfast or Dessert. Great for morning breaks, or as a mini dessert with a scoop of ice cream.